It’s fair to say that toilets are not the most ergonomically designed pieces of bathroom kit. If mobility difficulties are making it difficult for you to use your toilet comfortably, then rather than spending a fortune on a specially-designed toilet for the disabled why not consider our 3-in-1 Shower Chair and Toilet Adaptor by Homecraft? The 3-in-1 Shower Chair and Toilet gives you, at a fraction of the price, the increased seating height of a specially-made toilet. For the disabled bathroom user, this means extra comfort and practicality without the need to expend time and money on a complicated toilet installation. 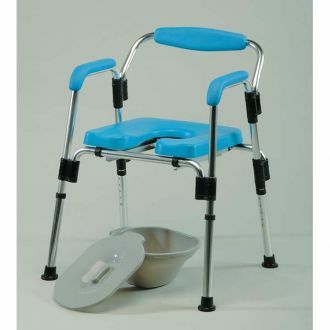 As the name suggests, the 3-in-1 Shower Chair and Toilet for the disabled user can be used in any one of three ways: as a standard shower mobility aid, as a commode with the supplied tray and lid, or on top of a standard toilet. This versatility is evident in every facet of its design, as it not only features adjustable height, so you can tailor the seat to your individual needs, but can also fold almost completely flat for storage and transportation. With its practical features, the 3-in-1 Shower Chair and Toilet Adaptor makes a great alternative to expensive comfort height toilets for the disabled members of your household – and at our unbeatable MBD Bathrooms online prices, there’s no reason to delay your purchase of this incredible mobility aid today! Click here to purchase a 3-in-1 Shower Chair and Toilet for the disabled. If you have any questions about the Homecraft 3-in-1 Shower Chair and Toilet for the disabled then please contact us – we’ll do our very best to help.